For years I have kept a calendar in the kitchen. It’s helpful to me to see the whole month and to have appointments and events written down in a place that I see often. Even when I had a daily planner or a PDA, I used a kitchen calendar. Tools like that can be useful, but a kitchen calendar is available to the whole family. When we moved to our current home, I couldn’t find an obscure place to put our calendar. Any available space was just out in the open, in a place where a calendar hanging on a nail would be unattractive. My solution was to purchase a calendar holder. It provides a frame for the calendar, a hook to hang it on, and basket underneath. Mine is just like the one in the picture above. I also found a couple of complementary plaques to hang on either side of it. I’ve had it for several years and have been pleased. The only drawback is that the holder is made to work with the calendar size that Current sells. Most calendars sold in stores are too large for the frame. I don’t mind. I like the smaller size. It meets our needs without being overpowering. Current sells many different calendars with nice pictures and their prices are reasonable. 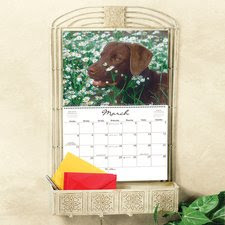 At present there are seven Current calendar holders to choose from. You might want to consider one for your home. For more great idease visit Rocks in My Dryer’s Works for Me Wednesday. That is very pretty! I have a planter that looks similar to that, but I can’t keep anything alive…may be I’ll bring it in and repurpose it!